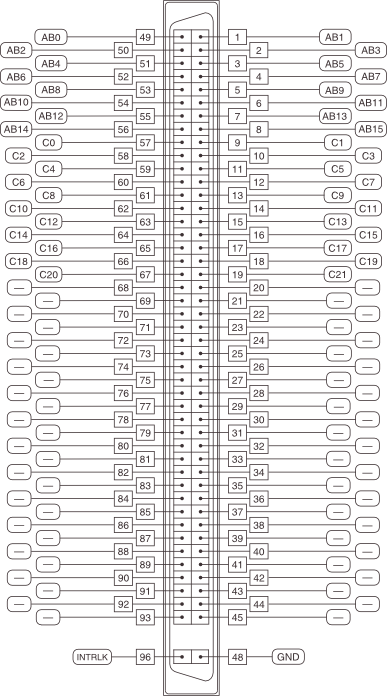 This document lists specifications for the SWB-2817A/B matrix relay card. All specifications are subject to change without notice. Visit ni.com/manuals for the most current specifications. Refer to the NI Switches Help for detailed topology information. This module is rated for Measurement Category I and intended to carry signal voltages no greater than 70 Vrms/100 Vpk/100 VDC. This module can withstand up to 500 V impulse voltage. Do not use this module for connection to signals or for measurements within Categories II, III, or IV. Do not connect to MAINS supply circuits (for example, wall outlets) of 115 VAC or 230 VAC. Refer to the Read Me First: Safety and Electromagnetic Compatibility document for more information on measurement categories. The protection provided by the SWB-2817A/B can be impaired if it is used in a manner not described in this document. 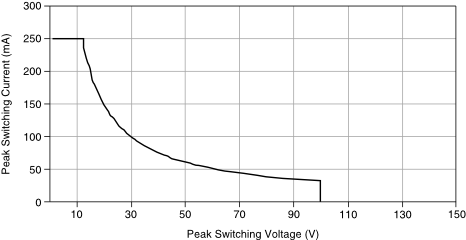 The following figure shows the peak switching voltage in relation to the peak switching current. Relays are field replaceable. Refer to the NI Switches Help for information about replacing failed relays.